At the age of 15 I took my first hatha yoga class at a local gym in my home town of Mona Vale, Australia as a way to relax & counter the effects of the stress of being a teenage model... immediately i felt it's powerful transformative effect and continued to practice regularly. In 2000 @ age 18 I moved to LA to continue my modeling & acting career... where so much emphasis was placed on the outer appearance, the way I looked. Yoga began and continues to teach me to love and feed myself from the inside first. A few years later I was introduced to Power yoga (thank you Kristina Anapau!!!) It was here that I met my husband Govindas (Ira Rosen) & from that moment onwards my life has deepened & shifted direction in the most beautiful of ways! With my husbands guidance I began my lifelong journey of being of service & sharing the healing gifts of yoga. I was given the spiritual name, Radha from one of my spiritual teachers Ram Dass... 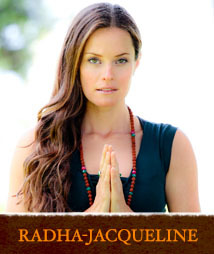 In India, Radha is the Goddess of devotion, and the name Radha connects me with the energy of the Divine Feminine. I feel so blessed to have such amazing teachers that continue to inspire me: Govindas, Bryan Kest, Saul David Raye, Shiva Rea, Mark Whitwell, Jai Uttal, Krishna Das, Shyamdas & Wah!... They continue to show me the way. Thank you!